A peculiar yet fascinating entry in our journey into macabre poetry today and one that I think needs a bit of back story. During the middle decades of the 20th century a folklorist by the name of Harry M. Hyatt travelled the US interviewing practitioners of, what we can loosely term, folk magic. Hyatt compiled these interviews and the knowledge he gained from them in a huge five volume work called ‘Hoodoo – Conjuration – Witchcraft – Rootwork’. Rather than give each interview a title, Hyatt headed them with a selection of quotations from the practitioner being questioned to give an overall impression of the dialogue therein. In 1974 the poets Jerome Rothenberg and George Quasha published a remarkable anthology of American poetry called ‘America: a Prophecy’. Recognising the strange beauty of Hyatt’s work, they included a small selection of his ‘titles’ within the anthology. So, here we have a folklorist’s obsession turned into found poetry. And if you would like to have your own poetry featured on this blog then feel free to get in touch. Details can be found . . . HERE. Yesterday I came home to find a small and peculiar brown paper package laying in my hallway, looking very out of place, otherworldly even, amongst the regular post. 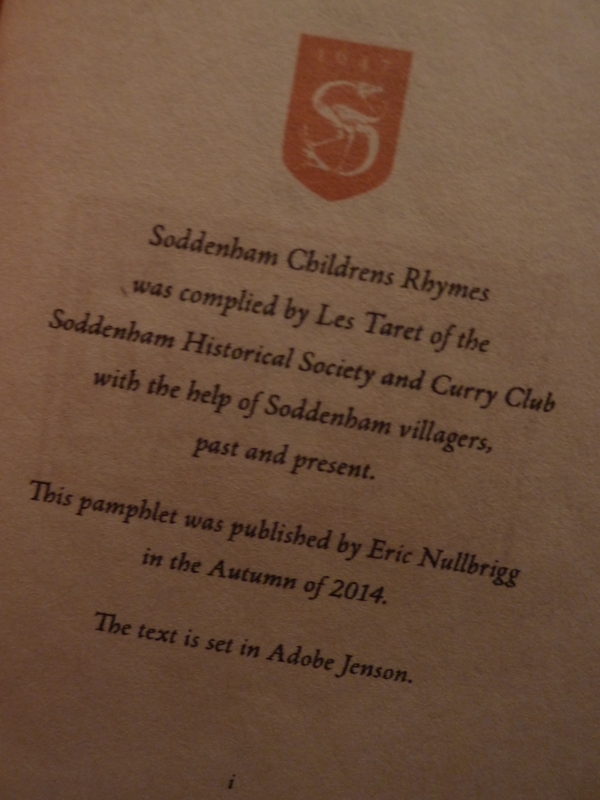 I carefully opened it to find my very own edition of the very same pamphlet courtesy of Mr Les Taret & Mr Eric Nullbrigg of the Soddenham Historical Society and Curry Club. What a beautiful thing it is, too! Gorgeously tactile paper bound with linen cord, the ends of which have been dipped in red wax or dye? At least I hope it’s wax or dye! It’s certainly deep red in colour!! 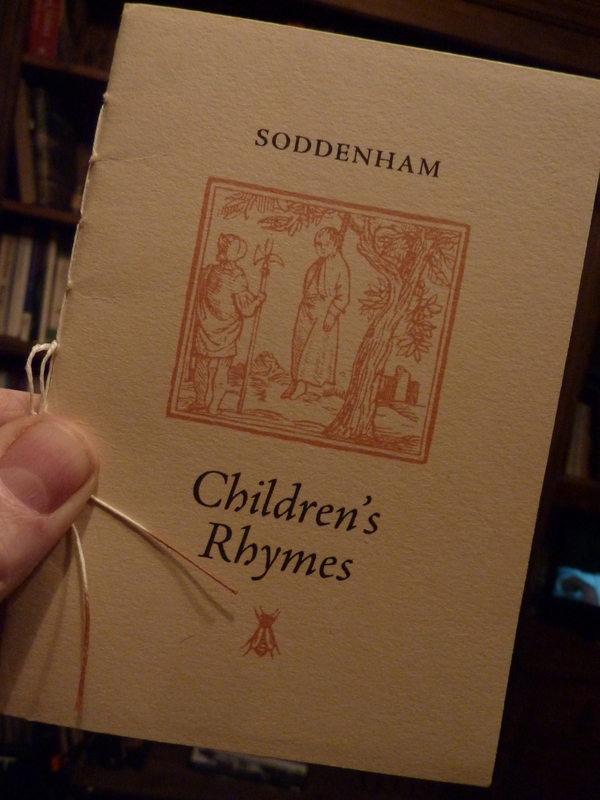 The contents are an assortment of children’s rhymes which have been, and possibly still are, popular amongst the children of the small Norfolk village of Soddenham. Many of these rhymes, as children’s rhymes tend to be, are of a rather sinister nature, pertaining often to the village’s troubled history with witchcraft. 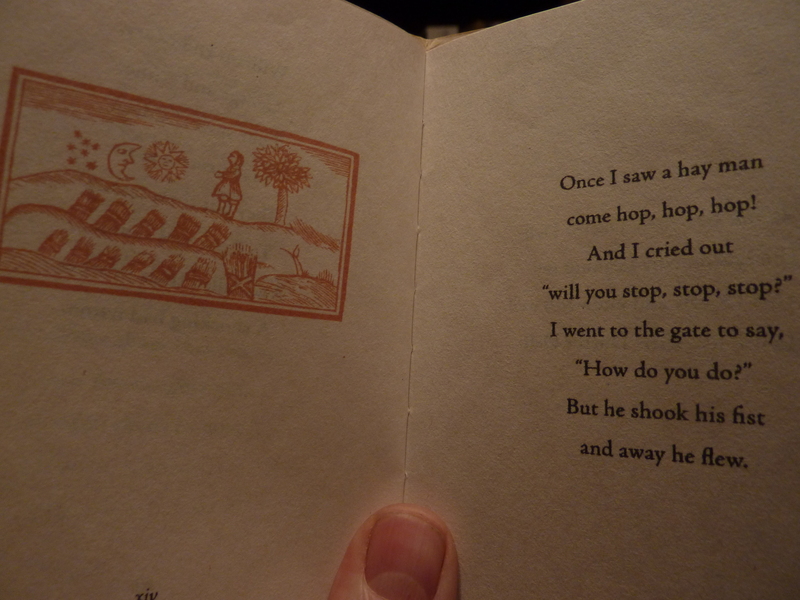 To highlight the nature of the verse we also have a series of woodcut illustrations with suitably dark overtones. I also received an invitation to visit the village of Soddenham. I may well take them up on the offer at some point although I will try to avoid the major festival dates as I understand that some locals in villages such as this can get a bit excitable with their bonfires, especially with those outsiders that arrive ‘of their own free will’. I will of course also practise thinking of brick walls. Just in case there are bands of fair-haired children with staring eyes roaming the streets. One can never be too careful.